Redwood City, California | Tuesday, April 11, 2017 — Jason Parker, a Wisconsin volunteer firefighter and founder of the nonprofit Gunnar’s Wheels, is GoFundMe’s April Hero for helping paralyzed dogs across the United States and beyond. 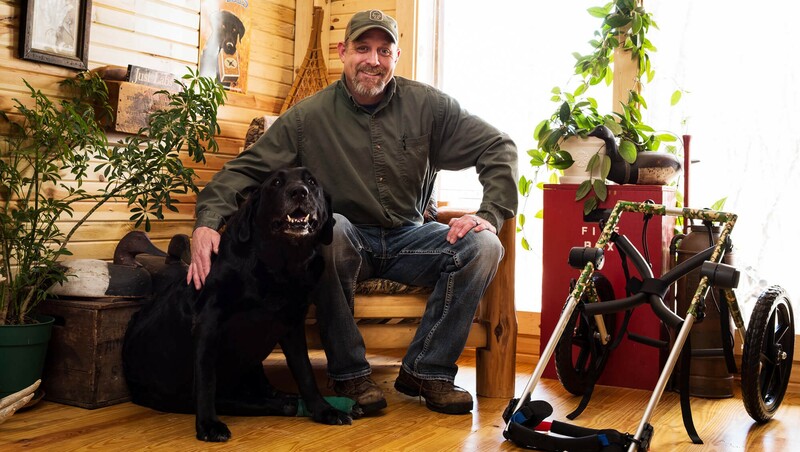 In the winter of 2014, Parker’s beloved dog, Gunnar, was hit by a truck and became paralyzed. Faced with an impossible decision, Parker chose to give Gunnar a chance at life. Parker found a canine wheelchair for Gunnar and helped him regain his strength. Then an animal rescue shelter in Texas saw Parker’s story online and asked him to help find a wheelchair for one of their dogs. He found a chair, and that’s how Gunnar’s Wheels was born. Since 2016, Parker has helped supply over 100 canine wheelchairs to people in 30 states and 3 countries. Recently, Jason shared an update from the first recipient of Gunnar's Wheels, a dog named Hope, who now runs without her wheels. "Hope was told she would never walk again. Her back was broken and she couldn't use her back legs. With the help of Gunner's Wheels she was able to 'roll'. It only took off from there. She now walks, runs, hops and fetches. She is the best dog. She wouldn't be around if it wasn't for her wheels." To watch that video of Hope's recovery without wheels, click here. To see videos of some of the dogs Jason has helped, and to find out more, check out his website, here. Launched in 2010, GoFundMe is the world’s largest social fundraising platform, with over $3 billion raised so far. With a community of more than 25 million donors, GoFundMe is changing the way the world gives. Find us on Twitter, Facebook, and Instagram.